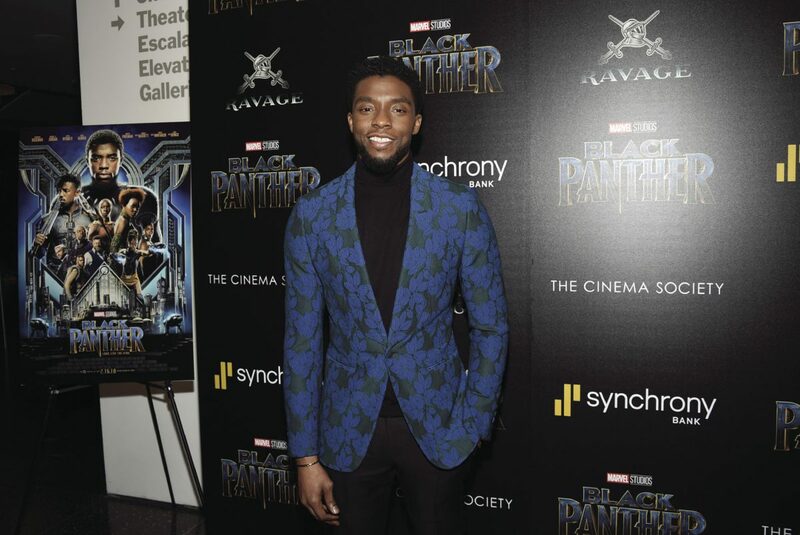 Chadwick Boseman attends a special screening of "Black Panther" at the Museum of Modern Art on Tuesday, Feb. 13, 2018, in New York. After transcending to an ancestral plane, a newly crowned king asks his father, the late monarch, how to best protect his country and people, especially without his physical presence and guidance. In Ryan Coogler’s cinematic adaptation of the Marvel comic, “Black Panther” adheres to these words as the hero must not only establish his own identity, but also rectify the errors of the past while still honoring the leadership of those before him. The head that wears the crown is heavy with the weight of history and pressures of the present, and he must create his own universe so as to move his people forward to the future. Fortunately, Coogler has provided the new king with an amazing array of supporting players who all get moments to shine amidst a dazzling cinematic world that merges traditional African culture within contemporary design that has a futuristic feel. In a genre dangerously close to fatigue, “Black Panther” is a fresh, energetic, richly textured cinematic experience: a shimmering feast for the senses as well as a powerful story. I’ve read how Coogler described the film’s style as tactile and that is evident in the gorgeous and intricate production design by Hannah Beachler: a mix of ancient symbols and pictographs and postmodern architecture, seen in everything from the high rises of Golden City to the structure of the royal court. Even the costumes by Ruth E. Carter tell individual stories in their beading and jewelry and silhouettes — a harmonious blend of form and function as the characters’ advanced technologies extend even to their clothing. With his father’s words in mind, the character of the new King T’Challa (Chadwick Boseman) returns to his place as leader of Wakanda, a fictional country in eastern Africa whose strength was forged by its foundation atop a powerful metal called Vibranium and sustained through its isolation, appearing to the outside world as a largely agrarian country. In reality, it has the most advanced technology on the planet due to this metal and a people as mentally advanced in science and languages as physically ready to defend their home. This theme of isolation, and its positive and negative aspects, is threaded through both the story and its invisible structure: for example, every Wakandan person wears a bracelet of kimoyo beads that not only represents their personal history but serves as a virtual communication device, like a holographic iWatch. It serves as a connective tissue of sorts that permeates and strengthens the citizenry and the alliance of five tribes within the country. As the film unfolds largely within this lush and idyllic cinematic world, there is such a constant feeling of “new” unlike any Marvel offering before, such as Swedish composer Ludwig Göransson’s beautifully dynamic score of Senegalese drums and Fula flutes, horns and harps and rhythmic integrations of the quietly sombre and resoundingly triumphant. As T’Challa’s reality becomes more haunted by secrets of his family’s past and challenges to his leadership, the score grows darker, but the strength of his advisors and protectors is bolstered by the power of their accompanying musical flourishes. Perhaps most singular of all of Marvel’s heroic journeys, apart from all the egos and mythos and exhibitionism of the rest, is that this hero, King T’Challa, is willing to share the spotlight without sacrificing strength and gravitas — to admit that he is still finding his way. He is able to grow and progress due to the skill and strength of the people who surround him, many of whom are female such as his personal bodyguards, the Dora Milaje, led by General Okoye (Danai Gurira), and his friend and spy, Nakia (Lupita Nyong’o). Coogler and co-writer Joe Robert Cole retained and enriched his female characters with fully formed identities, who exhibit strength and devotion but still see their world with a critical eye. Gurira (best known as Michonne on “The Walking Dead”) absolutely steals the picture with her all-around badassery — the twilight chase scene through Busan, South Korea where she gets to ride atop a speeding car and launch her spear THROUGH OTHER VEHICLES is just fantastic, but her one-on-one combat skills are a sight to behold as she is equally graceful and merciless. Another fabulous female is T’Challa’s sister, Shuri (Letitia Wright), the head of the Wakandan Design Group, the science and technology unit. She invents her virtual cars and metal gauntlets and ring blades with an artist’s eye and warrior’s hand, but her tender scenes with the king reveal a playful and funny closeness. The theme of connectivity is resonant even with the film’s villains, who ironically share a shallow bond that exists only as long as each is useful to the other. Erik Killmonger (Michael B. Jordan) hides a secret connection to Wakanda and has made his early abandonment as a child into his life’s structure, steering his natural intellect and abilities toward a path of destruction rather than creation. For Erik, death has become proactive, a means to an end where he will reclaim the connections that have since eluded him. His partner in chaos is Ulysses Klaue (Andy Serkis), a grunting bulldog of a man eager to pillage Wakanda and its most precious resource for the biggest profit. Black Panther definitely warrants multiple viewings — one just for the visual roller-coaster ride, and sets itself apart from the rest of the MCU with a formidable blend of good story and magnificent design: a look to the future of how a community can flourish and reach out to the world.